Hello, Gorgeous! 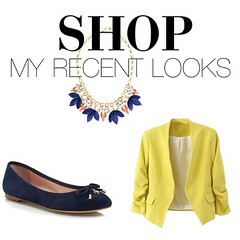 : Yellow Blazer and More Stripes. Although some of my outfits are planned beforehand, most of the time I grab-and-go pieces in the morning and hope they look good when I put them together. Because I know my closet like the back of my hand, this usually works out pretty well. The only catch is that I tend to get in "moods" and wear similar-looking outfits all week. I think part of it is that my brain isn't functioning at 100% when I choose my outfits in the A.M. So I try to quickly style a version of something that I know worked earlier in the week. All-in-all, it's not a bad rule of thumb to keep in your back pocket. When in a rush, just wear you know works, or at least a similar version of it. Navy bow flats- DSW (Aldo brand) | Cute versions 1, 2 | My personal fave! "Olivia" rose gold/white watch c/o Wristology (exact) | Use code GORGEOUS20 for 20% off!